Q: Can I install a ClipperCreek 240V charging station outdoors? A: For outdoor installations we recommend installing a hardwired 240V EV charging station. All ClipperCreek charging stations have a fully sealed NEMA 4 enclosure that provides superior protection to the components inside the station from outdoor elements. The NEMA 4 enclosure ensures the components inside the unit are protected from the elements. We recommend a hardwired unit for an outdoor installation as it provides better weather protection for the connection to power. If you install the plug-in unit outdoors we would recommend installing a watertight cover over the plug and outlet combination. We also recommend checking with a licensed electrician to ensure installing a 240V plug-in charging station outdoors meets your local codes. There was a change in the National Electric Code requirements at the beginning of 2017 that allowed 240V charging stations to be installed outdoors, however sometimes local codes can vary. Q: If I install an indoor rated ClipperCreek 240V charging station can I charge my vehicle outdoors? A: Yes, many customers have room to install their 240V EV charging station in their garage, but do not have room for the electric vehicle itself. Customers have installed the station inside their garage and run the charging cable outside to charge the electric vehicle. If you do plan to use the station in this fashion we do recommend not closing the garage door all the way down on the charging cable, but leave a small gap to ensure the longevity of the cable. 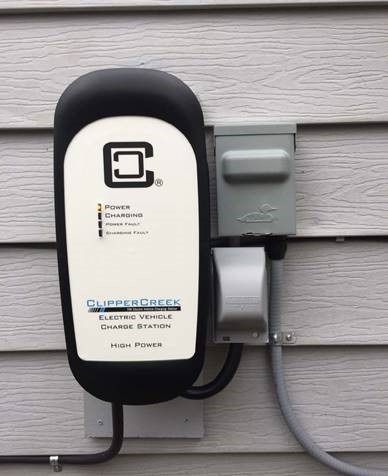 Q: Can I charge my electric vehicle with a ClipperCreek EVSE when it is raining or snowing? A: Yes, the connector on ClipperCreek electric vehicle charge stations are designed to drain water and the inlet on your vehicle is designed to drain water as well. Once the connector is connected into your vehicle, a water tight seal is formed. 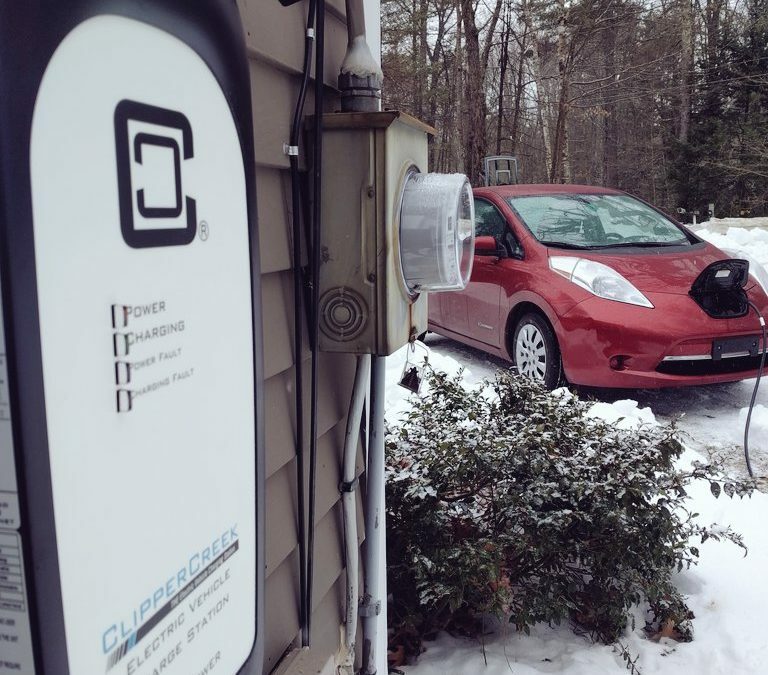 It is fine to charge your electric vehicle in the rain or snow. 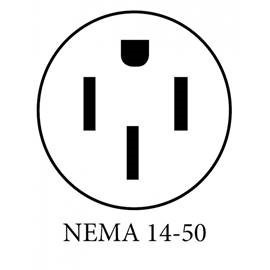 Also interested in installing outdoor with the 14-50 NEMA outlet. If you can send a picture. Will use a rain proof enclosure for the plug an outlet. Do I have to install the charger upside down, since the cable need to enter the enclosure from the bottom not the top? For an outdoor installation we would recommend a hardwired unit as this provide the best weather protection for the connection to power. If you must install a plug-in HCS unit outdoors we would recommend checking with a licensed electrician to ensure this meets your local electrical codes and install a weather proof outlet cover as you had mentioned. I am interested in installing a plugin (NEMA 14-50) unit outdoors. The plug cord seems rather short though. Is there enough room wrap the charge cord around the unit? It doesn’t seem so in the photo above. The supply plug length is about 12 inches long and this is something that is limited by National Electric Code, we are not able to make it any longer. Depending on where you mount the covered outlet it may make it difficult to wrap the charging cord around the station, however we do sell an accessory that can hold the charging cable for cases like this. This accessory is called our Cable Cradle and it sells for $19: https://store.clippercreek.com/accessories/ev-charging-cable-hanger-cable-cradle. Please note that for an outdoor installation we would recommend a hardwired unit as this provides the best protection for the connection to power. We also recommend checking with a licensed electrician to ensure installing a 240V plug-in charging station outdoors meets your local codes. There was a change in the National Electric Code requirements at the beginning of 2017 that allowed 240V charging stations to be installed outdoors, however sometimes local codes can vary. Hi there. I was planning to use your HCS-40P, Plug-in charger cable with an OUTDOOR 14-50 Nema outlet. Is this safe? I saw in this article that you recommend a hardwired unit for outdoors. I was not planning for that, so I just want to make sure before I purchase. I’m planning to move next year and I wanted to be able to just unplug and take it with me. Our HCS-40P models are rated for indoor or outdoor use and are built into fully sealed NEMA 4 rated enclosures. The NEMA 4 enclosure ensures the components inside the unit are protected from the elements. We recommend a hardwired unit for an outdoor installation as it provides better weather protection for the connection to power. If you install the plug-in unit outdoors we would recommend installing a watertight cover over the plug and outlet combination. I have emailed you a photo showing how one customer did this. We also recommend checking with a licensed electrician to ensure installing a 240V plug-in charging station outdoors meets your local codes. There was a change in the National Electric Code requirements at the beginning of this year that allowed 240V charging stations to be installed outdoors, however sometimes local codes can vary. Can you email me a pic of the watertight cover installation? Thanks. Hello Anita, thanks for reaching out! We have processed this request and you should receive an email soon from one of our ClipperCreek Customer Service Representatives. I’ll be installing my HCS-50 inside my garage, but charging my car outside (the J1772 charging plug will be holstered on the outside of the garage wall. Does the 50A circuit breaker need to be GFCI or can it be an ordinary 50A breaker? Thanks! Our stations do not require a GFCI breaker as there is protection built into the station. You would only need to have a GFCI breaker installed if it was required by your local codes. What would the cost be to install an outdoor charging station? The cost of installation varies and would depend on many factors (circuit breaker size required, wiring size, length of the run, etc.). We would recommend receiving a quote from a licensed electrician. If you need assistance in finding a licensed electrician in your area you can use our installer locator tool at https://www.clippercreek.com/installers. You are not obligated to use these installers and any licensed electrician can install our products. We always recommend receiving multiple quotes to ensure the best value possible.